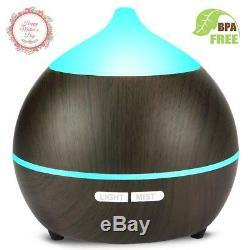 Ultrasonic Diffuser Of Essential Oils Aromatherapy Humidifier LED Light US 250ml. It's your space, you decide the smells. Just add water, place a few drops of your essential oil of choice, and be amazed as unpleasant odors (like stubborn cigarette smoke and pet odors) are rapidly replaced by your favorite fragrances. Relax Your Mind and Refresh the Air Quality. Benefits from reducing fatigue to relieving insomnia to lowering mental stress. It's time for you to enjoy a good night's sleep and an energetic morning. Keep Your Skin Hydrated and Moisturized. 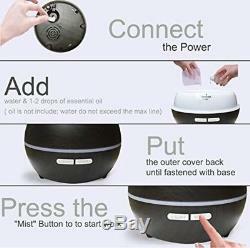 The ultra-quiet portable ultrasonic humidifier keeps your living space clean and properly moisturized. Don't let prevent dry air, dry skin, and flu/cold germs ruin your day, The auto shut-off feature will turn the device off when it runs out of water. Do not add water over MAX line(less water, more mist) 2. Oil is not included in the package. Please use the Water-Soluble Essential Oils, which will help fill your space with more fragrance without affecting mist output 4. 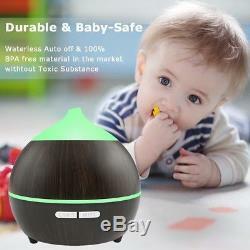 We recommended that you clean the diffuser after each use to avoid clogging and other problems. Empty the water and gently wipe the water tank to dry. DO NOT wash the device directly under the water tap. Aromatherapy & Our Inspiration - Never seen a wood grain oil diffuser in a such lowest price even if in Black Friday, perfect Mother's day Gift! 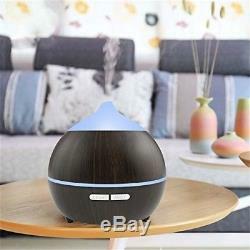 More amazing is that multifunction aromatherapy device with it. 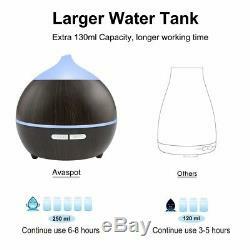 It features a large and easy to clean 250ml water tank, a 7-color LED light that you can change to fit your mood, two mist stream modes, as well as a safety auto shut-off function to protect from burning out and ensure safety, energy efficiency and peace of mind. Natural Design - Wooden base and a large area of wood grain design, it'll look nice just sitting on your shelf, even when it's not in use. 100% new PP material in the market without toxic substances to keep your life healthy. Imagine that you bring in a masseuse and cut some cucumber slices for your eyes, and you've got yourself a spa. De-Stink Your Home - Ultrasonic atomization in aromatherapy, keeps the strong fragrance of the essential oil all day long at a reasonable expense; relaxing, energizing, helping focus, setting a right sleeping atmosphere. 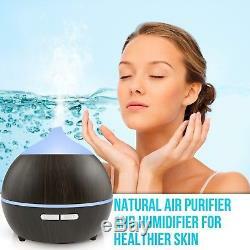 Also functions as an mist humidifier. Shoots a strong, cool, continuous vapor straight into the air, cover the smell of pets or smoking, and protect you family from excessively dry air, microorganisms, allergens, dust, and more! Power cord is hidden in the diffuser. 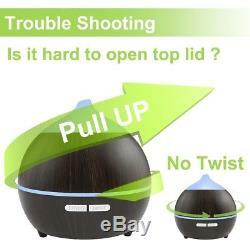 Safer Auto Shut-off - To protect from burning out and ensure safety, every Holan oil diffuser adopt original imported Taiwan Jinyuan circuit board which covered by waterproof coating, more than 1000 times strict high-low temperature test, so work status is more stable than other diffusers in the market. 0: Weight: 1.26 pounds. We stand behind our products. Our stock all ships from our US-based warehouses. Most orders are in transit for two days but some may take longer. 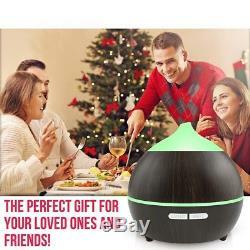 Ultrasonic Diffuser Of Essential Oils Aromatherapy Humidifier LED Light US 250ml x1F381Aromatherapy Our Inspiration - Never seen a wood grain oil diffuser in a such lowest price even if in Black Friday, perfect Mother's day Gift! X1F381 Natural Design - Wooden base and a large area of wood grain design, it'll look nice just sitting on your shelf, even when it's not in use. 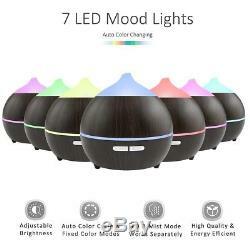 Imagine that you bring in a masseuse and cut some cucumber s. The item "Ultrasonic Diffuser Of Essential Oils Aromatherapy Humidifier LED Light US 250ml" is in sale since Sunday, September 2, 2018. This item is in the category "Home & Garden\Home Décor\Home Fragrances\Essential Oils & Diffusers". The seller is "greatdeals_99" and is located in Austin, Texas.